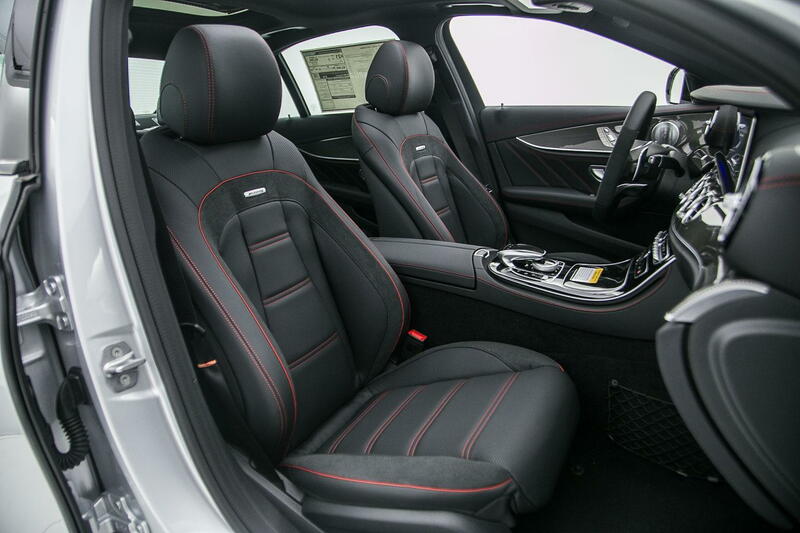 Iridium Silver, Black nappa w/ red stitching, Metal Weave trim, Dimamica wheel, panorama, 20" twin 5-spoke, heated and ventilated seats w/ rapid heating, Pano roof, Multicontour seats/ massage, PO2, Acoustic comfort pkg., Night package. Odd thing is that this is alsmost exactly how I would have ordered the car...maybe not the night package - but its growing on me. Really great looking car. Congrats - I am surprised that car sat around as long as it did... Great color and option combination. Congratulations. She's definitely a beauty and feel free to lurk with us. Would love to hear more about your experience with the E43 as you go forward with ownership. WOW. Exactly how I would have ordered it. And if you got a great deal, that is a NO BRAINER! how do you like the suspension so far? 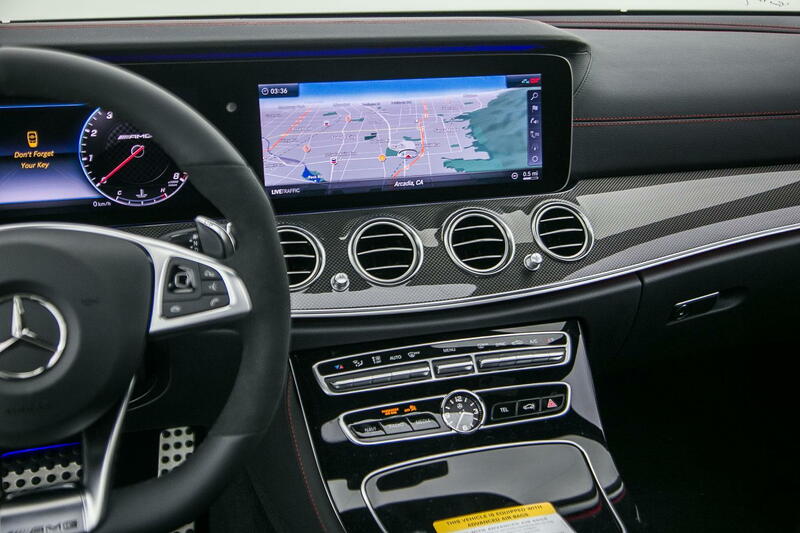 and feedback from steering wheel, pedals, etc? Its the best car Ive ever owned. Comfortable, great handling and very fast. Its even thrifty on gas if driven sedately. Switch it to sport plus and its a very credible sport sedan. I've driven it on the track (something that 90% of 63 owners never do) and it plays the sport car bit with aplomb. You will love it. I have 25k on mine and its reliability has been perfect. The 63 may be second to none but as a daily driver the 43 is probably a better car overall. Great car , I purchased mine several months ago, the darker grey color version . Very happy with the car , a great combo of luxury and power. The only thing that was bothering me was the runflats......decided to change them to standard tires(I have the 20in AMG wheels) and what a difference in ride quality. but the "ride too harsh on 20 inch wheels" theme kept showing up in the tests so I was kind of worried. No issues so far, the ride is fine and will probably be even better with some Pilot Sports. I take the Canyons in the Santa Monica Mountains (i.e. : Mulholland) to work almost daily and the car is amazing thru the corners. .92 G stock is pretty good! Im coming out of a Dodge Challenger SRT 392 so I miss the acceleration a little bit, but it was a heavy car. The E43 feels rlealy light on its feet in comparison. Thanks for the welcome everyone. Been a member here for over 14 years thru several Benz's! Yes it has the air suspension. Discount was over $11k US off MSRP or about 13%. It took about three weeks of emailing back and forth..​​​​​​.and when I priced out a nicely optioned C43 it was within $5k of this car. 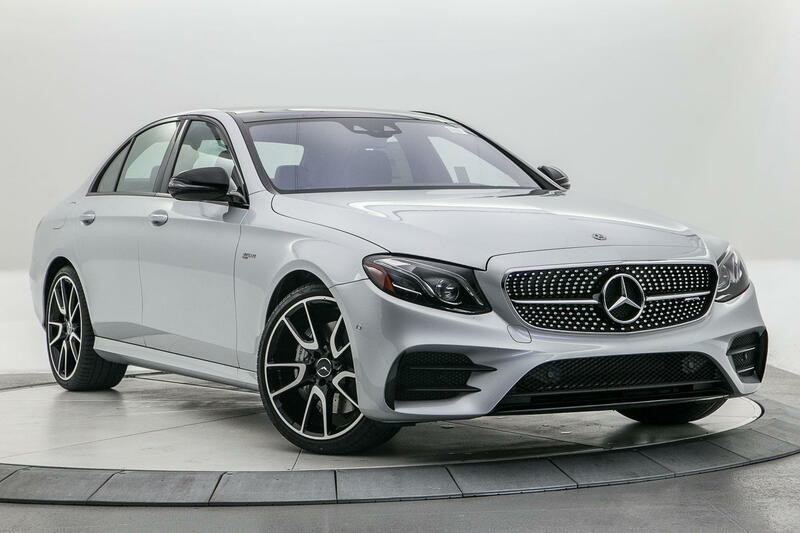 Discounts on all AMG cars are hard to come by...Best anyone would do on a C43 was $2k. No brainer! 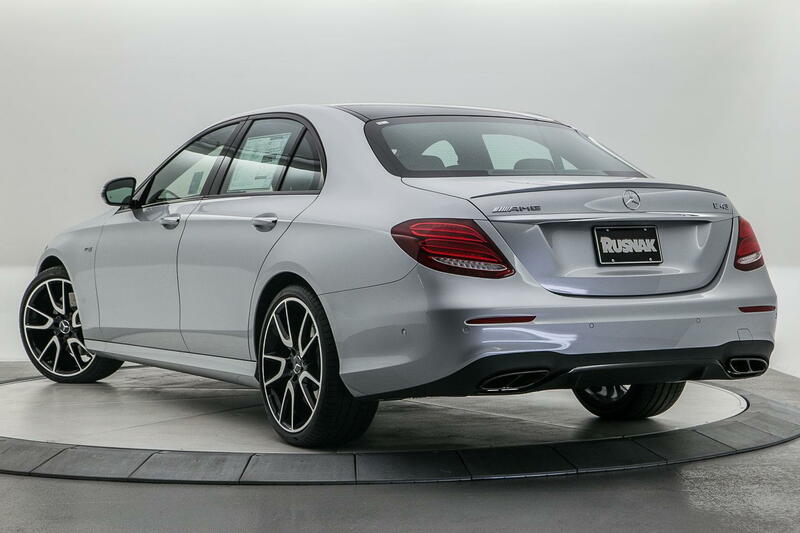 $5K to move from a C class to an E class! You will get all of that back and then some on resale and/or trade in. I love your car but with my driving to Vermont for skiing, the base E450 Luxury Styling (higher ground clearance in snow) is a better fit for me. 13% off of list on an AMG is great! Great car! I've had mine for about 2.5 months now and love it!! Glad you got a good deal!! Beautiful. Thanks for posting and yes, by all means, stay and play with us guys on this forum!! Looks great, nice ride. 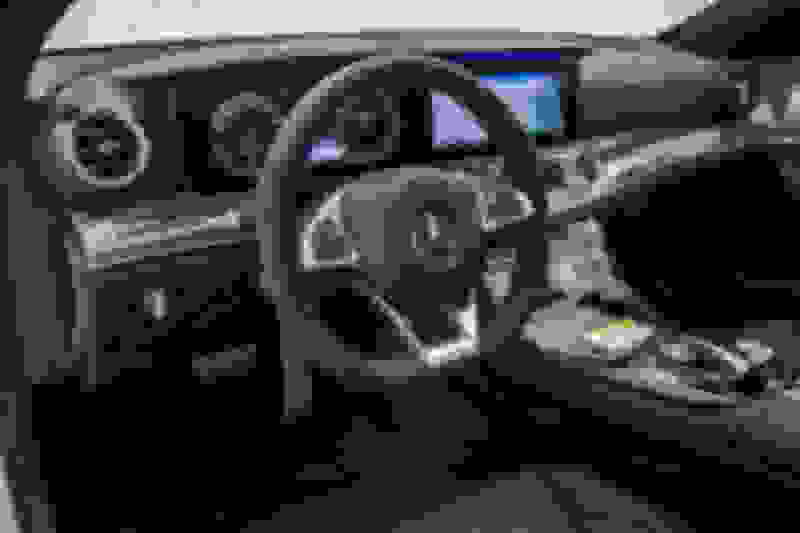 I had a 2018 E63 AMG wagon, it was very fast but I just not really like the it felt. It was very stiff and I did not like the steering feel. Keep in mind you could always do a tune on the E43 if you want more power, that'll get you near 500HP. It looks great and I love your enthusiasm! Beautiful car, and sounds like you got a great deal. Congrats! I'll probably hang out here because the AMG E section are not "43" friendly from what I've read so far. Sweet ride, and you got a good price. What color white is it? Diamond or Polar? Its a brand new for 2019 shade of white called "Iridium Silver"...sorry nothing personal just having some fun. E43 is not available here. But E53 starting price is 81500 USD without VAT.